This mode can help you if you don’t want all calendars to have the same contents. 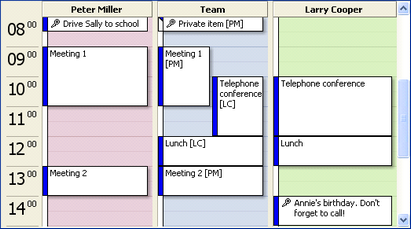 Instead you just want one team calendar to have the sum of several individual calendars. The individual calendars will not be changed. Where the different calendars are located is up to you. You can (as described above) use data in multiple PST files, from the same or different computers or different Exchange accounts. Example: The calendar "Team" is automatically filled with data from the other calendars. · Two individual calendars (left+right) were merged into one (center). · Calendar entries can be marked with the initials of the owner. · Subjects can be removed for private items (Example: Peter Miller). · Private items can be completely skipped (Example: Larry Cooper). · Each calendar can be in an Exchange server (public or private) or a PST file. • You will need an empty team calendar as target folder. Create such a calendar in Outlook, if you don’t have one. Either in an Exchange account or in a PST file. • For the task type choose "Team calendar / Team contacts"
• For the source folder, choose the individual calendar. Note: If you don’t want the team calendar at a central place, but in each PST file / in each Exchange account, you can achieve this effect with additional tasks. Simply create a new, empty calendar and synchronize (default task type) the empty calendar with the team calendar.